The concept of recycling household waste is fast catching on – and setting up a worm farm is the ultimate way to do it. ‘Everyone should have a worm farm – schools, office staff rooms, homes – because you can dramatically cut down the amount of waste you send off to the landfill every week, and that just has to be good for the environment’. 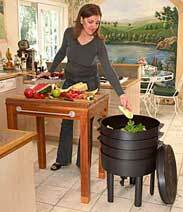 Produce your own organic fertilizer. Share a Worm Farm with a neighbour/friend. Join the Zero Waste Revolution. Check out the video below showing our worm farm, then why not come and see for yourself how compost worms will convert your food and paper waste into rich 100% organic fertiliser. 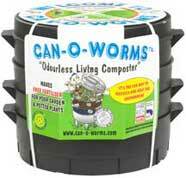 '4 Acres' Worm Farm has everything to help you set up a worm farm and is more than happy to answer any questions. 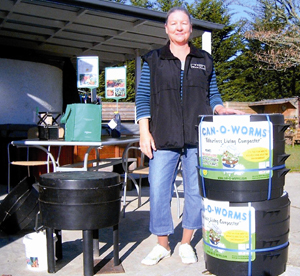 We supply Compost Worms, Worm Juice & Worm Castings which make a healthy fertilizer for all your indoor & outdoor plants and a highly effective composting system called ‘Can-O-Worms’ to retail outlets and gardening enthusiasts as far afield as Wellington. The Can-O-Worms is user friendly, easy to operate and fun for all ages. It can be kept indoors or outdoors depending on what space you have. By putting worms to work in this innovative system you will be converting your food waste into nutrient rich 100% organic fertaliser that potted plants, garden and vegetables will all love. Most important of all you will contribute to the reduction of rubbish at your local dump. Find out more about Can-O-Worms now!